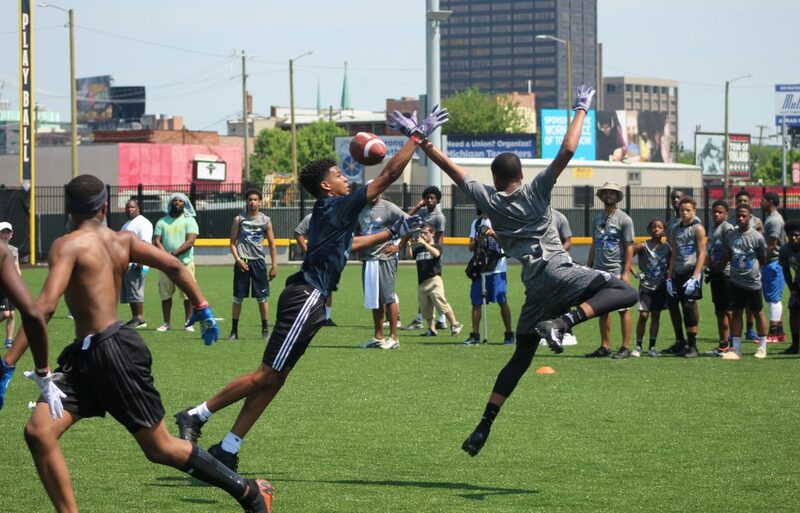 On Sunday May 27th, the Corner Ballpark presented by Adient was filled with the top middle school and high school football players in the state. Current Dallas Cowboys defensive back and former PAL alum Jourdan Lewis held his wide receiver vs. defensive back camp, which was presented by Sound Mind Sound Body, Top Cat, Adidas and Detroit PAL. This skills camp was invite only and featured two sessions; the middle school session ran from 1:00 p.m.-5:00 p.m. and the high school session was from 3:00 p.m.-7:00 p.m. Jourdan Lewis, a graduate from Cass Technical High School and University of Michigan had a special guest at the camp in Delano Hill. Hill, who currently plays for the Seattle Seahawks is also a PAL alum and a former teammate of Lewis at Cass Tech and the University of Michigan. The Willie Horton Field of Dreams presented by Meijer was filled with coaches and college football players who were helping out with the camp. Players who attended the camp participated in various drills that showcased their skills. Lewis was excited for this camp and was glad to see how many people came out. “This is something that I wanted to do since I got into the league,” said Lewis. “Being able to have this opportunity to give back to a place where I started means a lot to me.” Lewis played for the Westside Cubs when he played in PAL and Hill played for the Eastside Tigers. “I made a lot of friends and close relationships during my years with PAL,” said Hill. Both Lewis and Hill knew what it took to get to the next level on the collegiate and professional side and they want to give their knowledge and experience to the youth so they too will know what it will take to make it, not just on the athletic side, but in life period. Growing up in Detroit can be a challenge for some people. Jourdan Lewis and Delano Hill had an amazing support staff growing up and they used that as fuel to get where they are today. From their PAL coaches to their high school and college coaches, everyone pushed them to be the best they could be. But you can’t forget about the parents, the ones who have been by their side since day one. Both Jordan and Delano’s mothers were at the camp and both mothers talked about how proud they are of their boys. “He’s (Jourdan) been a hard-worker ever since he was little,” said the mother of Jourdan. “To see how much he has matured into a young man means the world to me.” Delano’s mother had nothing but smiles on her face talking about the things her son is doing. “PAL has been a great influence on Delano and it has helped him become the man that he is today,” said Delano’s mother. To have former PAL alumni give back to the community and to an organization they were a part says a lot about the program. Detroit PAL would like to thank Jourdan Lewis and his co-host Delano Hill for having the vision for this camp and giving the youth the opportunity to showcase their skills. We would also like to thank Sound Mind Sound, Top Cat and Adidas for making this event possible.